Union Health & Family Welfare Minister J P Nadda issued strict instructions to HSCC to complete the validation process of DPR within 15 days by drawing members from CPWD and State PWD so that the 500 bed hospital project at Naharlagun doesn’t suffer. His directives came when Arunachal Pradesh Chief Minister Pema Khandu called on him here this afternoon. CM informed the minister that the state is committed to start the academic session of Tomo Riba Institute of Health and Medical Science during 2017-18, as the people of Arunachal Pradesh are eyeing the institute as a status of pride. CM requested union minister’s intervention for relaxation of MCI norms for recruitment of faculties so as to enable the state government to man the faculty posts, as far as feasible, with the present specialist doctors working in Arunachal Pradesh Govt. He also pleaded to put a word to AIIMS and NEIGRIHMS to help the first medical college of the state operationalize. While informing about 5 district hospitals been up-graded to Zonal General Hospitals, CM requested the Ministry to consider for infrastructure development and equipment procurement for these zonal hospitals for which proposal has been prepared by the HSCC. He sought for a direction to Nursing Council of India from the ministry to recognise Nursing College and schools of the state so that the Diploma/Degree holders from these institutes could serve in the state and also seek placements outside the state in super speciality hospitals. 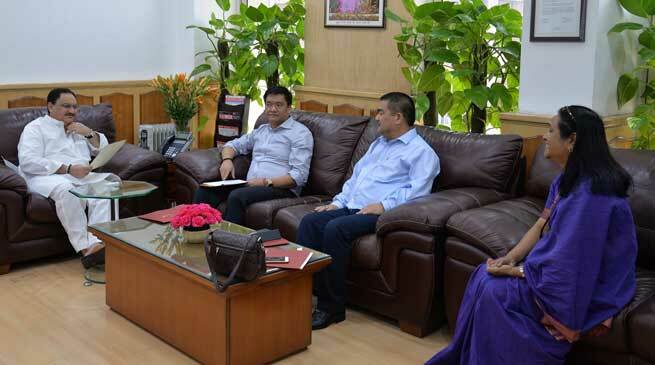 Nadda assured all out support to the state and said he would soon visit Arunachal Pradesh to organise a day long workshop on health related schemes. CM was accompanied by Health Minister Jomde Kena, Chief Secretary Shakuntala D Gamlin, Dr. R Doye Joint Director, Medical Education and Dr. D Bagra during the meeting.